The Church, established by Jesus Christ and guided by the Holy Spirit, continues the salvific ministry of Christ in the world today. Thus, the Church is both the Sacrament of Communion and the Sacrament of Salvation. This text presents the mission of the Church; her infallible teaching authority; the Sacraments as the primary means of transmitting God’s grace; the role of the Blessed Virgin Mary, the Mother of the Church; the Universal Call to Holiness; and the four marks of the Church. This textbook corresponds to Book IV: Jesus Christ's Mission Continues in the World Today (The Church) in the USCCB curriculum framework. 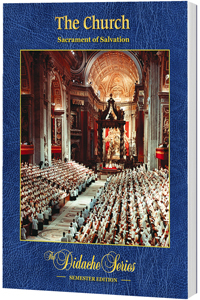 It has been published with ecclesiastical approval from the Archdiocese of Chicago, and it has been granted conformity with the Catechism of the Catholic Church by the USCCB Subcommittee on the Catechism.